I’ve been a Brooks Range wanderer since 1999 and I can’t seem to stop going back. I’ve floated all the classics- from the Noatak to the Koyukuk and everywhere in between. This year I wanted to find something different. 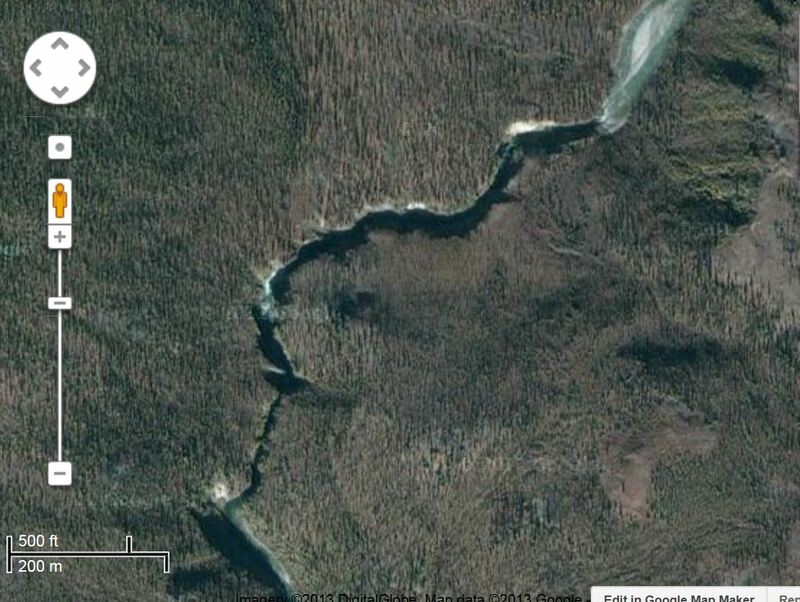 With Google satellite imagery I noticed a topographically unique and intriguing area- the Iniakuk River Valley. 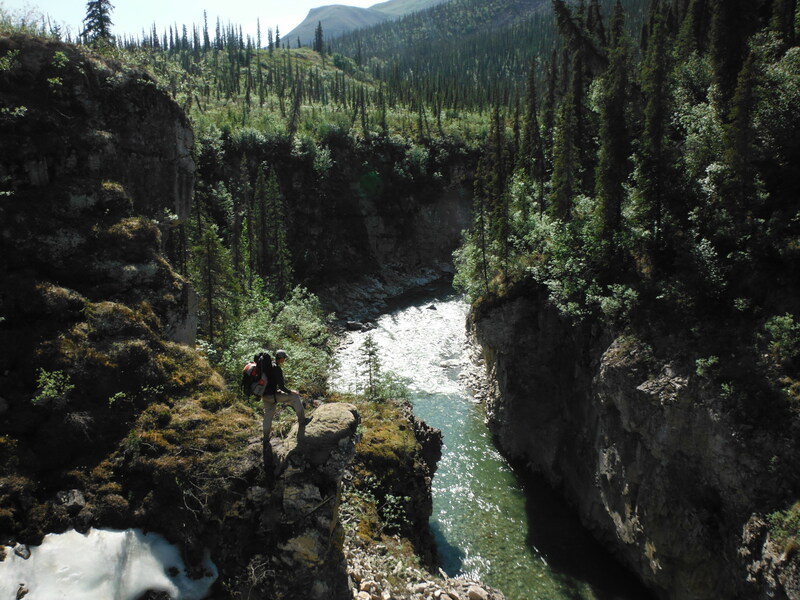 Unlike most rivers in the Brooks Range that flow through large U-shaped valleys, the Iniakuk drops into an impossibly narrow canyon. 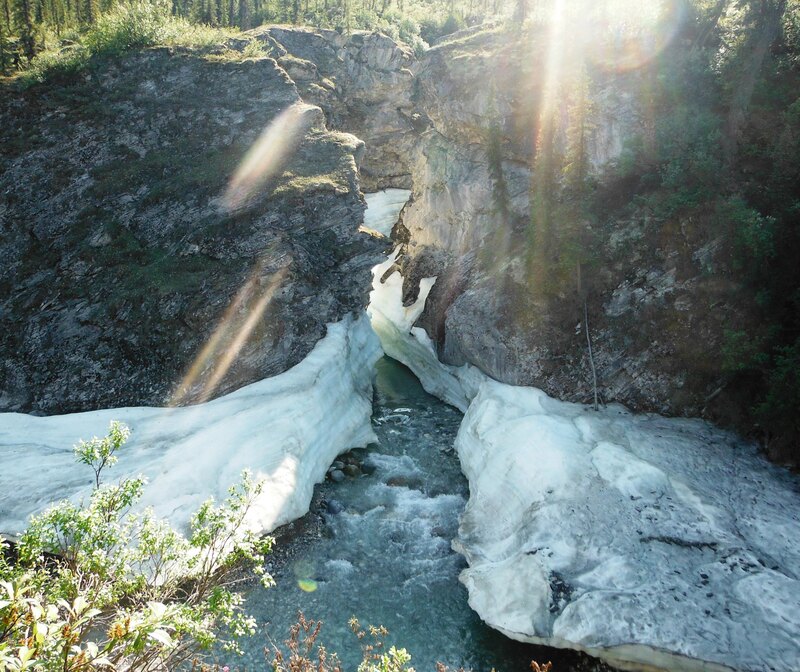 The river derives within Gates of the Arctic N. Park and flows south for 40 miles becoming a tributary of the Malamute Fork of the Alatna River. 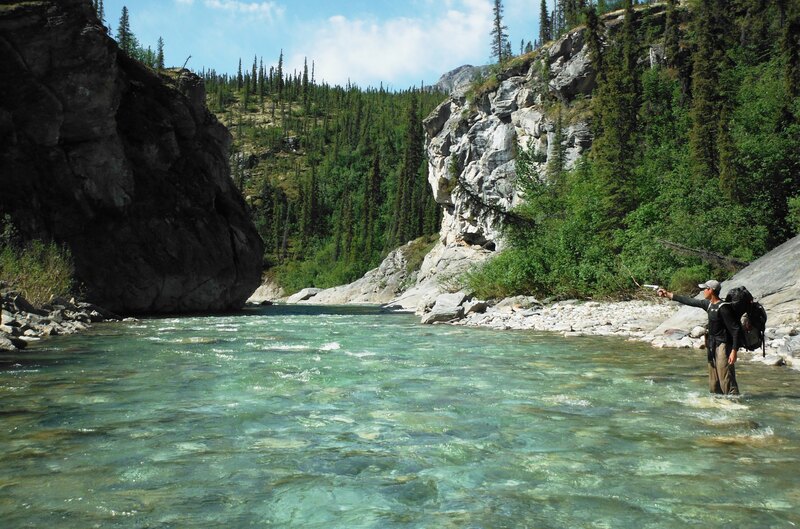 To extend the length of our trip, Mike Cragen and I started in Anaktuvuk Pass, floated the John River to Wolverine Creek, and then hiked up that tributary to the headwaters of the Iniakuk. This section has been thoroughly documented on various websites- more info can be seen HERE. Near the headwaters, we hiked up the southern fork of Wolverine Creek. 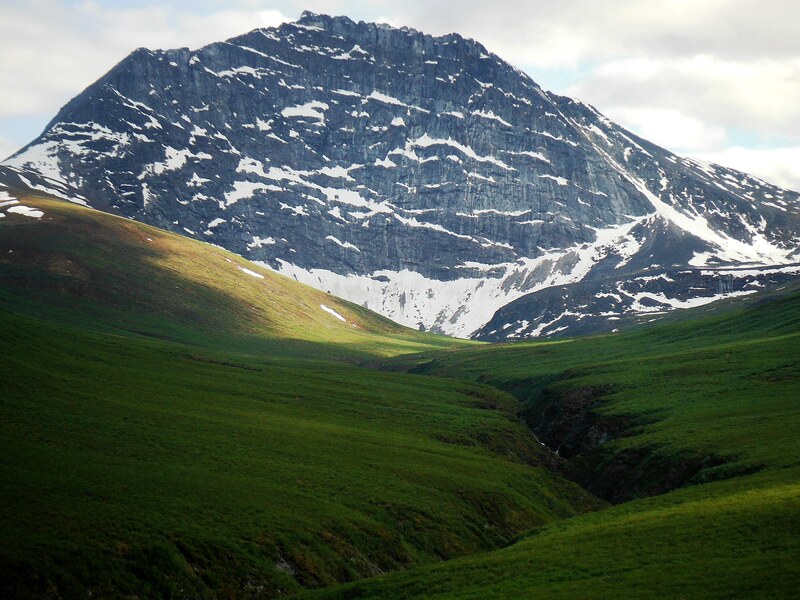 Brooks Range Traversers typically take the more direct path over Nahtuk Mountain so I was curious if anyone had done this route. 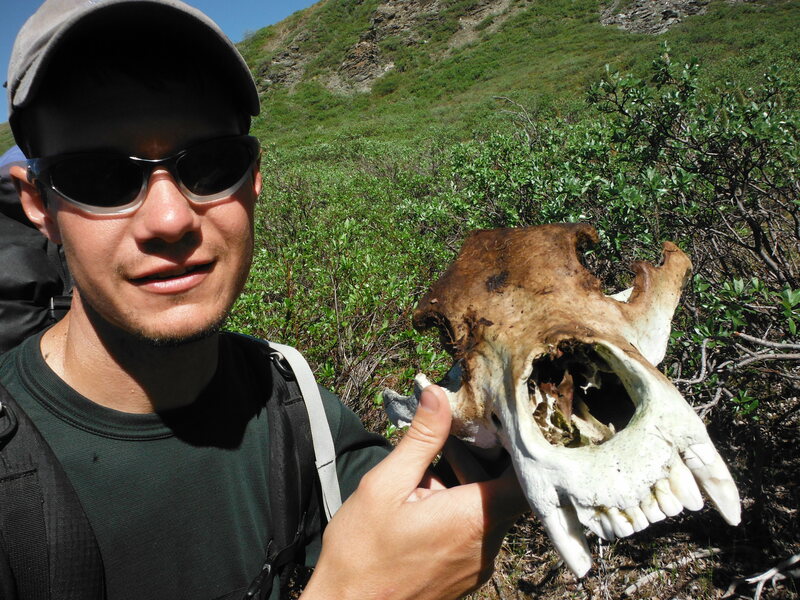 That question was answered on the prominent game trail where we found an old grizzly skull imbedded in the tundra- fangs up. Someone would have at least checked it out. We had problems with aufeis (overflow ice) on the John and Wolverine and expected the Iniakuk to be a muddy, scary river as well. We were elated to find a crystal clear stream, shallow enough to walk in when the bushwhacking got bad. We found enough water to inflate our packrafts at the confluence of the major tributary flowing from the northwest. About a mile below the outfall of Ernie Lake, the canyon begins. I was informed by Jay Jespersen of Brooks Range Aviation that the Iniakuks first descent was done by veteran guide Chris White back in 1996. Chris and his friend accessed the river via Ernie Lake and used Austrian-made Grabner inflatable canoes. He took paying clients down the river again in ‘97 and ‘98 but it is not known if anyone had been down the river since. Satellite imagery shows the gorge pinching until the river itself disappears. During the first descent it took Chris and his companion eight hours to get through the first canyon. We decided to portage, which I was bummed about because the entrance was a beautiful PR3. 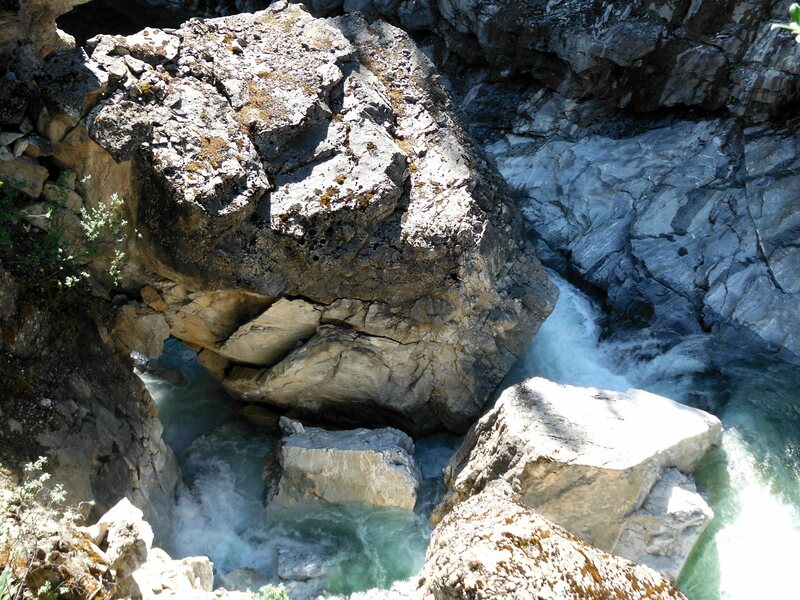 The easy portage is found on river-left and has amazing views into the canyon. Three quarters of the way down, the chasm opens and a difficult PR5 in observed. Apparently the side of the canyon collapsed many years ago and a house-sized rock sits firmly in the middle of the river. To the right, the river goes off a glancing five foot waterfall and to the left, straight into an intimidating cave. I was glad we had portaged. Chris and his clients had to line the canoes through this section; I imagine that was not fun. 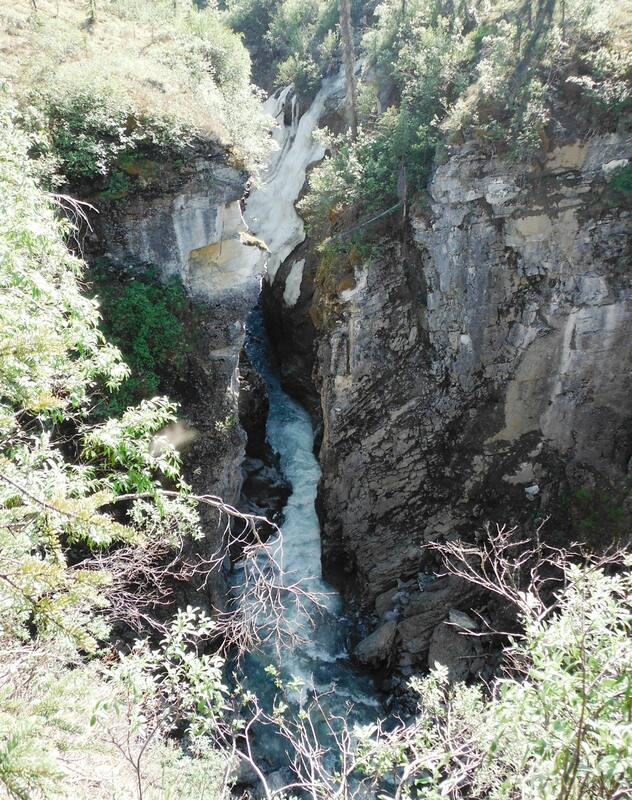 In some places the canyon was just 12 feet wide with sheer cliffs towering on either side. Below the sieve, the river continues through PR2/3 rock gardens. On river-right a tributary has formed an impressive slot canyon that beckons for exploration. Another mile down a second gorge appears. We didn’t run that one either. We were low on time and the entrance looked gnarly. After the portage we looked back up the canyon. A short river-wide ledge drop poured into a pool of Caribbean-like blue water. 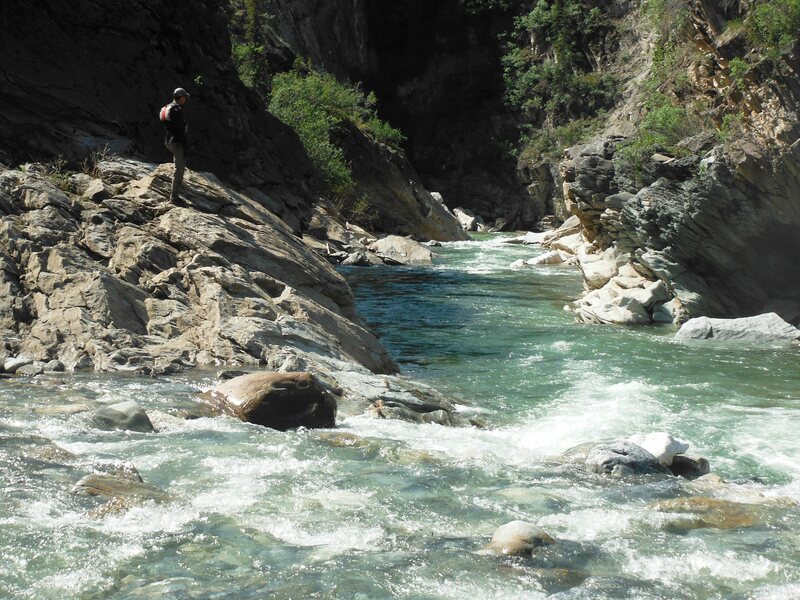 Chris White ran this section with his clients (who were experienced whitewater kayakers) in 1998. They considered it a class three. The river continues as a PR2 with a few spicy surprises to keep you on your toes. The fishing is pretty good too. Every hole conceals hungry grayling. You may even find char and the occasional lake trout. Bears begin to congregate in the Iniakuk valley mid-July in anticipation of the chum salmon run sometime in August. Chris, who had at least 11 years guiding on rivers in the Brooks considers the Iniakuk to be the ‘beariest’, especially on the lower portion of the river. So be careful, the bears are truly wild there and unpredictable. We hiked to Iniakuk Lake for our pickup. There aren’t any good camp spots on the lake so spend your last night on gravel bars near the river. If the Iniakuk were located anywhere else in the world it would be a mecca for whitewater enthusiasts. Mike and I both thought it looked like a river you might find in California but with bears instead of tourists. Who knows, perhaps the Iniakuk will once again fade into obscurity- although, I certainly hope not. It is a truly magnificent place, and it deserves to be recognized.